When our long-time client walked us through their soon-to-be new home, we immediately fell in love. BIG time. Not with how it looked at that very moment, but with the potential we saw and the dreamy location that was going to make it all worth it. The location was the easiest selling point…The major renovations ahead took a little more convincing. Thank goodness for the vast and powerful world of Pinterest. Ready to see where we started? This was the old kitchen located in the back of the house right off the rear entry from the garage. While the kitchen’s location offered an amazing view of the water, it was an odd shape and very cramped feeling. We decided this back corner would better serve the homeowners as a mudroom. That meant opening up this space into the den that was located right next to the kitchen. Only problem was that the wall was a load bearing wall and would require a steel beam for support if removed. No big deal, right? Sort of. The ceilings were already a little low- at just under 8 feet, so having a beam drop down at least ten inches was asking a lot. That’s where the kitchen layout and design came in to save the day! How does one incorporate a steel beam into the middle of space without dropping the entire ceiling or creating an ugly soffit? Glad you asked! The answer is integrate the beam into a beautiful ceiling design! Here we dropped the tops of the cabinets to allow room for the beams and added layers of detail so that it seems like the beam has been there forever. No sweat! Except there was a lot of sweating. Here’s the beam and all the beautiful bones that allowed us to open up this kitchen. “That’s one big beam ya got there. Ya just gonna put a soffit around it and call it a day?” - says mostly everybody. Are you ready to see the AFTER??? You won’t believe your eyeballs! The New Neoclassic, a timeless mix of modern and traditional. Can you tell which beam is THE beam? 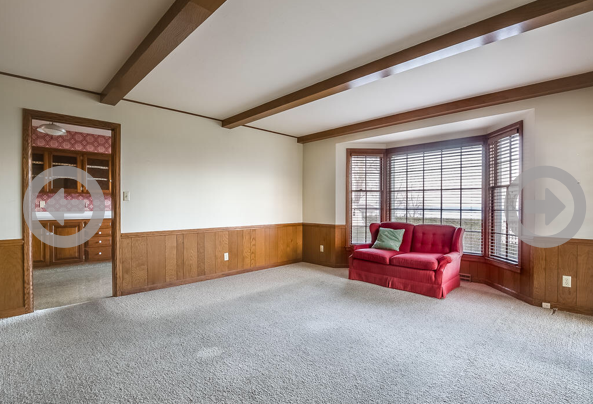 Had we just put drywall around the beam and left it all alone, looking stranded in the middle of the ceiling, it would have seemed like an after thought. Or worse, a mistake. So, we added another beam and connected the two large beams with layers of crown molding. Adding details adds intention and a sense of history. I only obsessed over using that Jill Rosenwald bowl in this project for like, 7 months. Totally normal to obsess over bowls. Can we talk about how white kitchens will always and forever be beautiful? WHY do white kitchens stand the test of time while all the other trends come and go? I think it has to do with how fresh and clean white looks, and how it allows other aspects to stand out. It doesn’t hurt that white is calm and peaceful too. 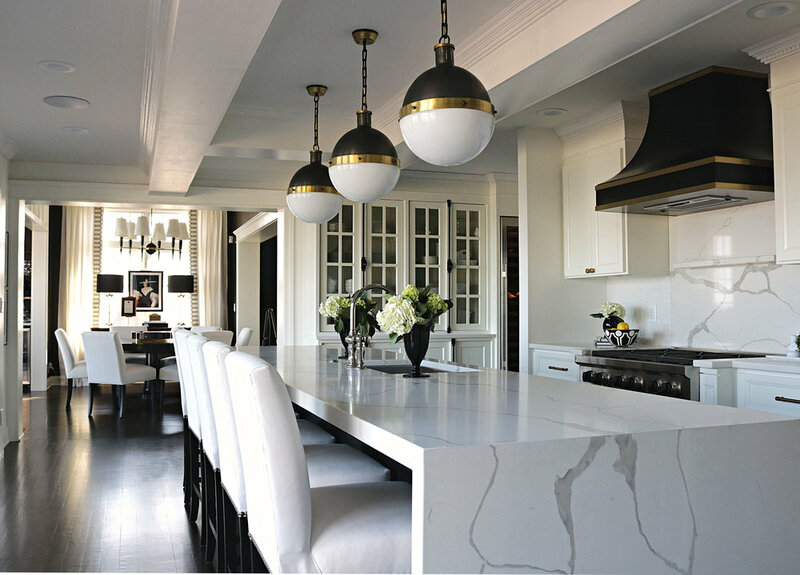 If an all-white kitchen is too much upkeep for you, doing your island in a contrasting color might be a great idea. Islands are doing the majority of the heavy lifting in new kitchens these days, so going medium to dark with the color can help keep maintenance to a minimum. Unless the heavy lifting involves a lot of baking. In that case, going light in order to hide the spilled flour might be best. Are you ready for your close-up Mr. Hicks? We’ve had our eyes on you forever too! We like for the kitchens we design to feel less, well, kitchen-y. One thing I LOVE to incorporate in my kitchen and bathroom designs, are pieces that look more like furniture than traditional cabinetry. For this kitchen, we designed a French style cabinet with cremone bolt hardware for storing dishes and glassware. I wanted something that looks like it could belong in a dining room since the kitchen opens right up to it. The visual transition from the kitchen to the dining room not only needed to appear seamless, it needed to feel seamless also. 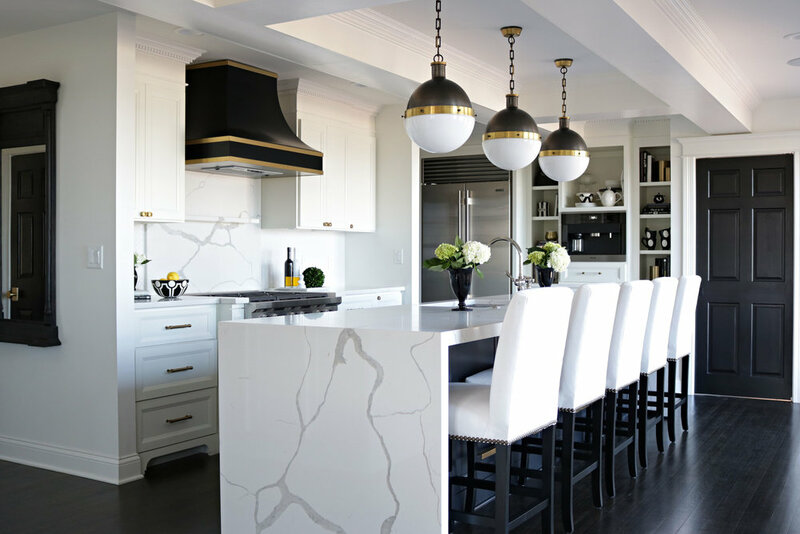 Designer Tip: A sight line that goes from “all function” with cabinetry, counter tops, appliances, and mostly kitchen-y feeling elements, straight over to “all elegance” and entertaining, can be a bit jarring. If you can add storage that looks and feels more like elegant furnishings near your transition area, your flow is going to be more on point. Could you believe your eyeballs?? Aren’t BEFORE & AFTER posts the best?! Now that you’ve seen the kitchen segment of this MAJOR major renovation, you can sign up for our newsletter to see what’s next! Here’s A LITTLE HINT: We transformed a bedroom into a master bathroom! We know. Woah. BE THE FIRST TO SEE! By signing up for our monthly newsletter, you’ll be the first to receive our posts and insider design tips! Rest Assured, we’ve got your info on lock down.